Why do disabled people feel ignored when it comes to voting? 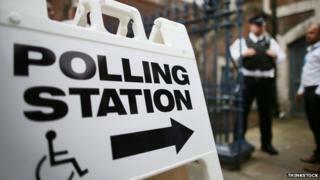 Too many disabled people are being denied the right to an independent and private vote, charities say. So what are the issues and who is it affecting? At the European and council elections last May, Adam Lotun, who uses a wheelchair, went to his local polling station at a community centre in Tolworth, Surrey to cast his vote. He followed the access signs to a ramped entrance but when he got to the door there was a three inch drop and no space to turn his wheelchair around. "It was the first year I had gone to vote since becoming a wheelchair user," he says, "and I couldn't even access the building. I was left feeling like a second rate citizen." The residing officers offered to bring the paper out to him, but as they were on a busy road with people walking past, he felt too uncomfortable to vote. "I wanted it to be private, and they weren't offering me that," he says. Lotun is not the only disabled person who has experienced problems with the voting system. After the last general election in 2010, Scope ran a campaign called Polls Apart which surveyed disabled voters at almost 1,000 polling stations across the UK. They found that 67% had one or more barriers to voting including no accessible booths and a lack of hearing loops for deaf people. With less than six weeks to go until the general elections, charities are working hard to make sure the voices of disabled people are heard. They say vast improvements need to be made before May if disabled people are going to have an equal opportunity to vote. People with learning disabilities have felt excluded from the voting process for a long time, says Tracey Garcia, the involvement and engagement advisor for Dimensions, a not-for-profit organisation that gives support to people with learning disabilities. She says many of them feel completely ignored from the voting process. Elaine Still has learning disabilities and for her the difficulties begin long before election day. Due to the complicated sign-up process, she finds it very hard to even register as a voter and says: "They're stopping me from having my human rights." She recently attended a training day run by Dimensions, and says without that support she wouldn't be able to navigate the online registration form. She is not alone. Research from the learning disability charity Mencap shows that 60% of people with learning disabilities didn't register to vote for the last election because they found it too difficult. The problems continue when they reach the polling station, says Diane Lightfoot, the director of communications at United Response. She says there isn't enough knowledge among presiding officers about correct procedures. Shadow Spokesperson for Disabled People, Kate Green agrees. She made an allegation at the last election that an unnamed councillor at a polling station in Trafford had been heard saying that a person with a learning disability shouldn't be voting. It's about time that as a country we got our act together to make sure that everybody can vote without being disappointed or frustrated by that process. An investigation was immediately launched by Trafford Council who say they found no issues in relation to the councillor's conduct or that of the polling station staff. But Green says that she feels "angry, outraged and ashamed" that people with learning disabilities are being made to feel unequal. "It is unacceptable," she says, "and a serious failure when it goes to the heart of our democracy." Research shows that Green's example is not uncommon. After the 2010 election, one in five people with learning disabilities told Mencap in a survey that they had been turned away at the polling station because of their disability. "There is still confusion over who can and can't vote," says Garcia, "whereas, in fact, somebody's mental state has no role to play in the voting process." Media captionThe Minister of State for Disabled People says candidates have a role to play in helping disabled people vote. Since last year, the Electoral Commission - the independent body which oversees elections in the UK - has reiterated its guidance to local authorities to ensure polling stations don't disadvantage disabled people. It says a registered voter, or proxy voter, cannot be refused the opportunity to vote on the grounds of mental or physical incapacity. Though problems are still being reported, the Minister of State for Disabled People, Mark Harper, is confident progress is being made. At this election, he says all main parties will for the first time be releasing easy read versions of their manifestos for people with learning disabilities - these are versions with simpler wording, larger fonts and more pictures. The minister admits there is still work to be done, that candidates should meet constituents with disabilities, and also talk publically about access to voting. But Liz Ball, who is deafblind and communicates through tactile fingerspelling - where words are spelled out on her hand - calls the voting process antiquated. "It still doesn't take account of technology or the shift in societal attitudes to disability," she says. "It's about time that as a country we got our act together to make sure that everybody can vote without being disappointed or frustrated by that process." Ball says online voting would not just make it easier for people with blindness, but those with other disabilities would benefit too. Henny Wahez, a lawyer for the law commission, an independent body that suggests areas where the law needs reforming, told Radio Four's In Touch that their focus at the moment is only on the existing ballot paper system. "Moving away from the current voting process is a matter for Parliament to decide," he says. It would be down to government departments to devise new policies and test technologies for both their usability and their security." At present the electoral commission has the job of providing the guidelines to local authorities on what they can and can't do to assist disabled people to vote. Andrew Scallon, their director of electoral administration, also spoke with In Touch and explained they are not tasked to do more than this. "Bluntly it's the returning officer's responsibility in the local area," he says. He advises that people who have problems on the day should address it there and then, and those who have had bad experiences in the past should contact their local authority to find a solution in advance. Ball says she finds it too difficult to get to the polling station, so uses a postal vote instead. She has a support worker who helps her put the cross on the ballot paper, but would much prefer it if she didn't have to disclose the information to somebody else. During the 2010 election, Ball felt so pressured to vote a certain way by the person helping her that she decided not to cast a vote that year. In the law commission's recommendations to the electoral commission, they stated there should be a general requirement in the law for a method or device which would let help blind or visually impaired people vote independently and in secret. At present, blind people use a stick-on tactile template, with corresponding holes over the blank boxes so they can feel where to put their cross. Wahez says that something better may supersede this method which many blind people say can be difficult. Back in Tolworth, Lotun says he will be going back to his local polling station this May to cast his vote, and the local Kingston Council have said they are taking steps to ensure the building in his ward is fully accessible to wheelchair users during future elections. Experts say the outcome of this year's general election is "impossible to call" so every vote really counts. With disabled people making up over 20% of the voting age population, Lotun says it would be foolish if efforts weren't made to ensure they can vote easily.